Mighty Lift’s High Lift Pallet Jacks (scissor lift pallet jacks) are an innovative, functional combination of a pallet jack and lifting table. They reduce muscle fatigue and repetitive bending, twisting and lifting. High Lift Pallet Jacks can increase productivity up to 40% by utilizing three functions with one piece of equipment: picking up loads, transferring work stations and raising them to the optimal working height. 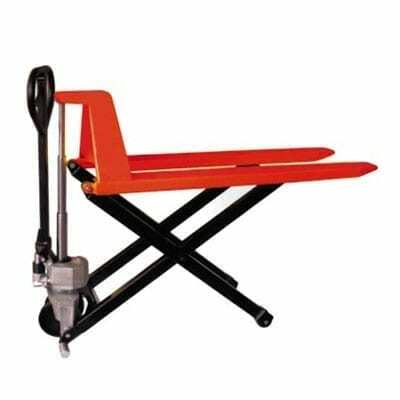 High Lift Pallet Jacks (scissor lift pallet jacks) can be raised to 31″ high via 3 chrome-plated hydraulic rods. This is compared to a raised height of 8″ with regular pallet jacks. High Lift Pallet Jacks have two side stabilizers which automatically extend out when the height is raised to 15″ high. High Lift Pallet Jacks are a versatile adaptation to hundreds of industry applications including feeding press binders, cutters, conveyors, assembly lines and many more. Fork Size 27" x 45"